Hello there. I’m currently trying to activate RandR for my motherboard VGA output, I tried using xrandr --setprovideroutputsource 1 0 but VGA monitor will still be in its own (tty1) session. The VGA monitor can be seen in ARandR (Screen Layout Editor) and Display applet but the actual screen itself will not output anything other than TTY1 login. I’m thinking RandR is the solution but have no idea how to restart VGA1 monitor TTY1 session. This TTY1 session are not accessible using Ctrl+Alt+F1, it will turn my current Cinnamon Desktop (DVI-0 and DVI-1) into TTY1 and VGA monitor will output just black screen. This TTY1 session will appear before my computer boot into LightDM login GUI, I’m thinking this might be Xorg auto detection giving a separate session on my VGA monitor. I have also tried to configure a **10-monitor.conf under /etc/X11/xorg.conf.d/ **but it seems to make thing worst. 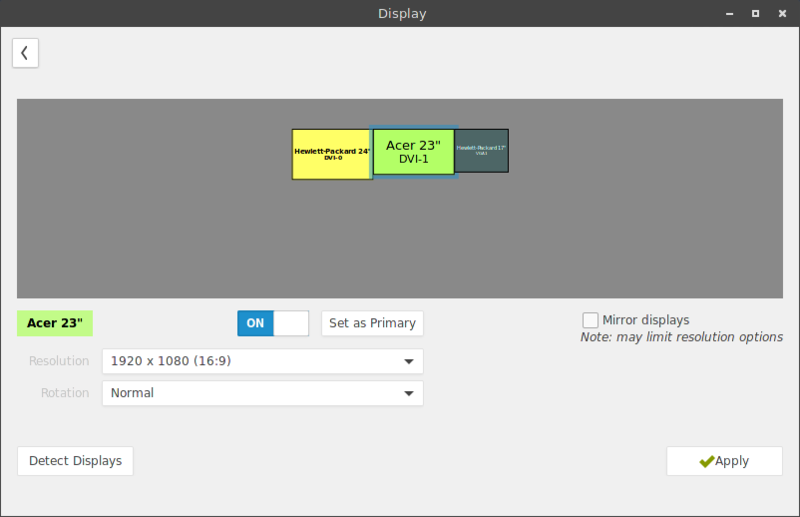 Identifier             "GPU Intel Haswell IGP"
Identifier             "GPU AMD Radeon R9 280X"
Device                 "GPU AMD Radeon R9 280X"
Device                 "GPU Intel Haswell IGP"
Screen          0 "Screen HP w2408h"
Screen          1 "Screen Acer H233H" RightOf "Screen HP w2408h"
Screen          2 "Screen HP vs17e" RightOf "Screen Acer H233H"